Here’s a rare picture of me doing a bit of work! A lot of people obviously read the Leader with the amount of hits I have gotten over the last few days. 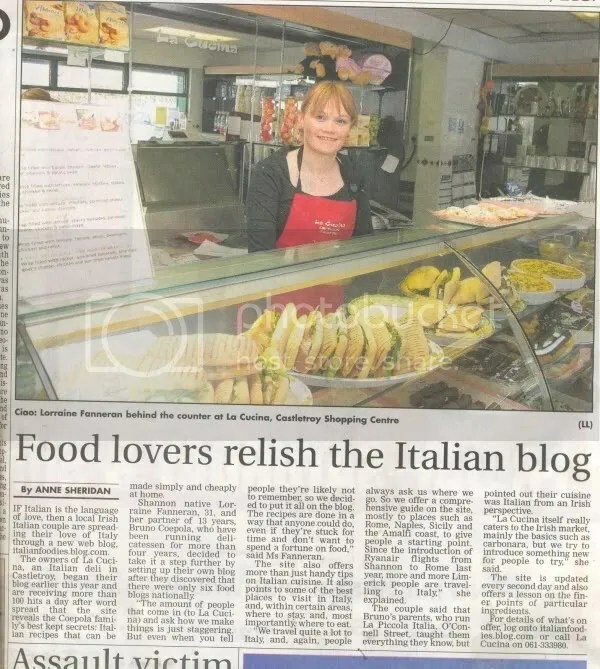 Just want to say a big thank you to Maz at www.styletreaty.com and squid at www.limerickblogger.org for all the support they’ve given to italianfoodies. You’d swear I’d won an oscar!!! But it is nice to be recognised especially as we only started in February and the blog does take a bit of time and effort. The only problem I’m having is that I am pretty bad at the technology side of things and it’s driving me crazy!!! If there is anyone out there who can tell me how to add links, improve my photos etc I would be very grateful. This blog is serious stuff now!!! I’d just like to say a big welcome to all the newbie lurkers and feel free to ask questions about any of the recipes or post a comment if you make any of the dishes. It’s great to get feedback as to how difficult or easy they are to follow, sourcing ingredients or just general opinion or chit chat. Enjoy and Bon Appetito! !